A quick note to thank the very generous Avery Elle for collaborating with us this month. Avery Elle is such a great company with fabulous products; be sure to check out their super fun stamps, dies, ink pads, designer paper – you name it, they have it. Something for every type of crafty person! This month we wanted to see RAINBOW creations; here’s a few that caught our eye. Chark – coffee? Yes please! With a rainbow band? Definitely! Gorgeous hot pink paper too. Lynn – those big ole balloons – SWOON; beautiful coloring! Ksenija – WOW; what a stunner; that gold embossing and gorgeous rainbow coloring, simply beautiful! 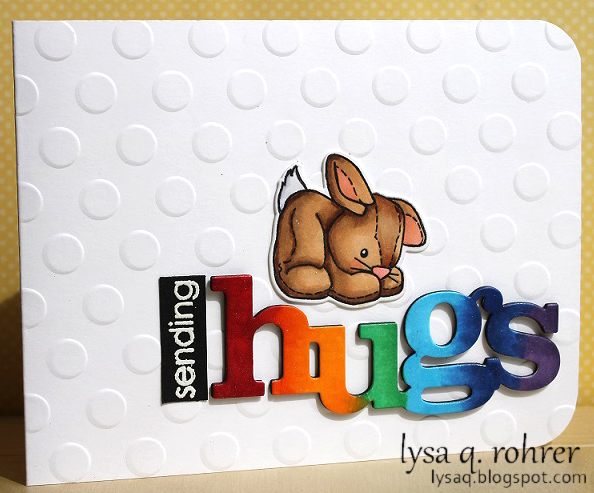 Lysa – seriously, who doesn’t love that bunny, that gorgeous rainbow HUGS, and polka dots! Adorable! On to random.org to choose the winner of a prize from Avery Elle. Beautiful rainbow pattern and how about that fab chalkboard effect!! Andrea, please send us an email and we will organize your prize. Thanks so much, everyone, for joining us this month. Stop back by soon to find out the details of our next challenge – it’s a fun one! Thank you so much for highlighting my card and congrats to the winner, Andrea! Thank you so much for the mention! Congrats to everyone & Andrea! thanks for the shout out and for the fun challenge! congrats to the winner! Congrats winners what a great gallery!